This case is designed for iPad 2(A1395 / A1396 / A1397),iPad 3rd generation(A1416 / A1430 / A1403),iPad 4th generation(A1458 / A1459 / A1460) ONLY.Do not fit for other Tablet. -This case is designed for kids,cute and smart, cartoon design fit for childrens'mind,your kids will love it. - Super light weight soft and tough case protect your ipad from damaging, dirt, scratches, shocks, and daily tears and wears.These shockproof cases come with a durable built-in screen protector that prevents damage to the iPad's display. 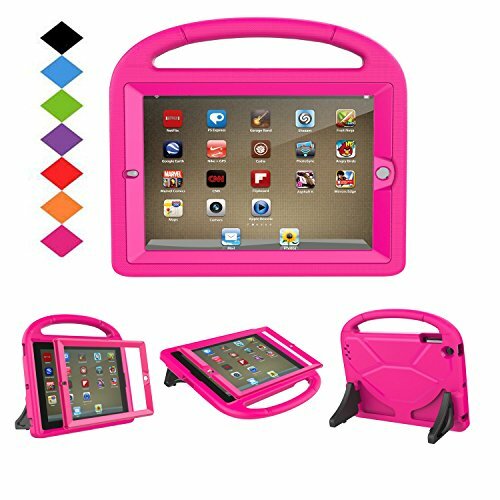 - Child drop proof kids iPad case, simply snap-on design that is easy to install and take off. LTROP provides a 100% satisfaction guaranty on every product it sold. If you have any problems with the case, please feel free to contact us and we will try our best to solve it for you. Compatible with iPad 2(A1395 / A1396 / A1397),iPad 3rd generation(A1416 / A1430 / A1403),iPad 4th generation(A1458 / A1459 / A1460),Do not fit for any other tablet. Made entirely of dense heavy duty EVA foam, the same kind that is used in the soles of high end sneakers. Material can withstand considerable wear and tear and provide extreme shock protection. Light weight and durable hazard free safe material perfect for your kids. Crystal-clear, fully integrated screen protector fits over top tablet display.Allows for responsive capacitive touch and keeps your tablet screen looking immaculate. Built-in kickstand is well supported, can be folded, won't take up space, Openings for power, earbuds, camera etc are all precise positioned without obstruction. Handle designed for comfortable one handed grip (suitable for smaller children's hands) for easy carry and travel. Handle folds into upright kickstand for learning and entertainment. If you have any questions about this product by LTROP, contact us by completing and submitting the form below. If you are looking for a specif part number, please include it with your message.